Beneficiaries: 193 persons, 126 (65%) of whom are low and moderate income. Project Description: The project will consist of approximately 4,141 linear feet of cured in place pipe (CIPP) lining, 39 main sewer line upgrades, 344 linear feet of 6 and 8-inch gravity sewer line replacement, the upgrade of 28 manholes and cleaning/inspecting 72 laterals to upgrade the sanitary sewer system in a portion of Service Area 23 in the Poovey Farms sewer collection system. This will address a U.S. Environmental protection Agency (EPA) Consent Order. Beneficiaries: 128 persons, 110 (86%) of whom are low and moderate income. Project Description: The project will consist of approximately 5,266 linear feet of cured in place pipe (CIPP) lining, 9 main sewer line upgrades, the upgrade of 27 manholes, and cleaning/inspecting 80 laterals to upgrade the sanitary sewer system to serve the residents in the Foster Street area of the City of Union, which includes Foster Street, Hamlet Street, Hampton Avenue, Knuckles Street, Woodrow Street and Willow Lane. Beneficiaries: 316 persons, 225 (71%) of whom are low and moderate income. Project Description: The project will consist of the upgrade of the existing Hillcrest and Cloverbrook Sewer Lift Stations that are deteriorated and inadequate. Even though the town has maintained and tried to upgrade the stations, they are so old that parts are unavailable. The Hillcrest Sewer Lift Station is located on Rector Street, in the Hillcrest Mobile Home Park, and serves Ruby Street, Mosteller Street, Cloninger Street, Rector Street and Knots Landing. 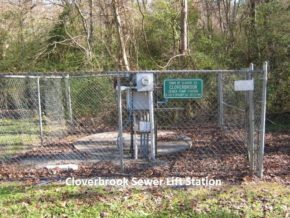 The Cloverbrook Sewer Lift Station is located east of U.S. Highway 321 off Cheek Road, and serves Cloverleaf Drive, Leaf Court, Cloverbrook Drive, Cheek Road, Generation Lane, Malik Lane and Iron Horse Lane.